At least I know she´s been reading my blog. Here´s the story if anyone missed it from a couple days ago. I hope she has this picture framed with my name engraved on the frame, because this is pretty much a visual representation of who I was in 1997 (and probably still am). A minor wreck. Yeah, I can relate to that - about 1999-2000 for me, though. 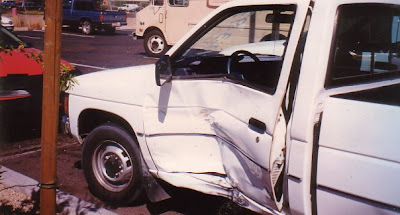 I drove a banged up pick-up around for about 5 years. hahahahaaha the TJ truck!!! oh no!